Pure Sine Wave Inverters are suited for sensitive electronic equipment, allowing motors to run faster, quieter and cooler, preventing computer crashes, noises & glitches in monitors, TV, game consoles etc. Convert DC power from your battery into AC power enabling use of electrical devices. Connect the inverter to your battery, and plug your AC devices into the power inverter to provide a reliable power source whilst on the move. Perfect for caravans, motorhomes, boats & trucks. Now fitted with an RCD Compatibility Switch. This Sunshine C-Series Power Inverter carries the e-Mark, this European conformity mark issued by the transport sector, indicates that this power inverter complies with relevant laws and regulations or directives. 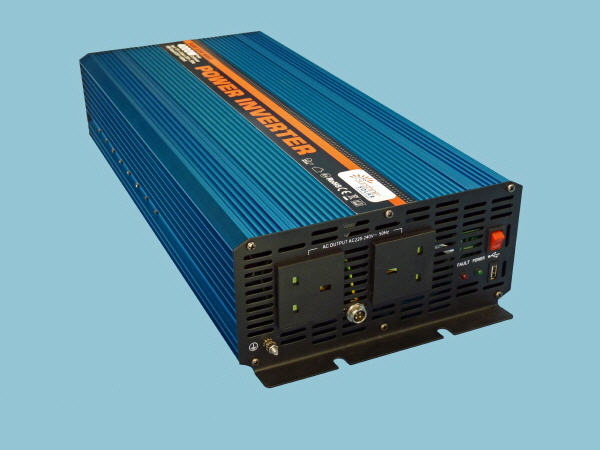 Sunshine C-Series Inverters are supplied with heavy duty leads fitted with terminal rings for easy connectivity to your battery. The Sunshine C-Series range of power inverters have advantages of being compact, light weight, & low noise, once connected to a 12V battery bank, you get 230V AC directly from the power inverters UK output socket giving you a stable power supply for running your electrical appliances.